Ever trailer a vetter sideways across trailer? Looking to maybe someday build a teardrop toy hauler, but I don't know about hauling the bike sideways like this, sure I could strap it down fine, but how well would the fairing and windscreen hold up to the crosswind? I've seen GoldWings and full dress Harley's parked sideways traveling down the road, but never in front of the trailer/RV. I also wonder if your design for the trailer would put a lot of weight behind the axle and cause handling issues, but I like the idea. Just a few small 1/4 bolts bolts hold a WJ to the bracket and the wiring plug allow quick and easy removal of the WJ from the bike. You could remove the WJ and stow it in the camper or in the suv while the bike is on the trailer. I've trailered my bike a couple of times and had to remove my WJ so I could properly tie it down. It's so easy I don't mind doing it at all. question is, if I put the camper on front, and the bike on back, would the camper outweigh the bike enough to make it pull right? i'd think the bike would outbalance the camper in my set up, but I'd be completely up for suggestions. also, what happens when I want to just go camping with it, and want to haul water tanks, or firewood, would the trailer pull better if the camper was ahead of the payload, or behind the payload? Those are all things that really need to be considered. I know for a fact that a trailer that is light on the hitch is not fun to travel down the road with. Every bump that you hit, the trailer will be wiggling/waggling all over the road. The further back the axle goes, the less chance you have of that happening. A formula that I found when I was making my trailer... The distance from the axle to the tongue should be 1.5 to 1.75 times the distance of the axle width. well, the trailer was built in 1968, its an old camper trailer, the camper was through quite a few floods and trashed, but i'm thinking of building a teardrop on the old frame. so that's what I have to work with. 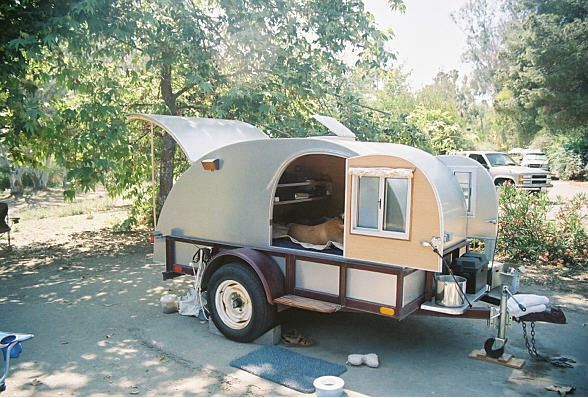 If your doing a DIY Teardrop you may want to consider building it so it can be removed from the trailer like those pickup camper tops. I saw one done that way several years ago. It was a really slick setup. He could use his trailer without the camper so it was a two in one deal. 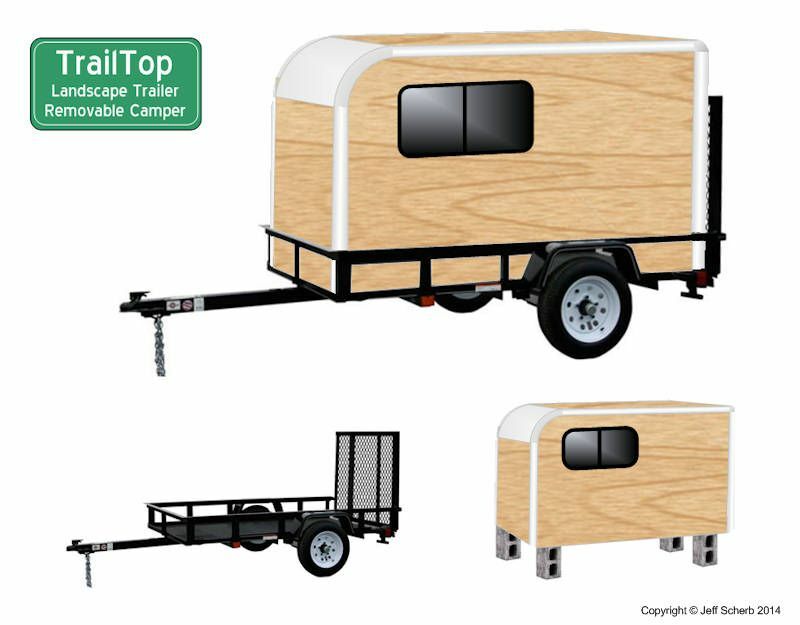 There are also a few trailer manufacturers that have optional campers as an accessory. You could build your camper so you have the option of loading your Bike in front or behind the camper so you can figure out which is best. Another thing handy about building one that way is you could take the camper off the trailer wherever you are going to be camping, which would prevent theft. No one would be able to simply hook up and take off with the camper and trailer. Removing the wheels from the empty trailer is easy as well so no one could just hook up and take off with it as well. I have not, but I also have seem some other bikes sideways. I have to say, I love the illustration Seth. Ideally, tongue weight should be 10% of total trailer weight.